Petra (or Rekem as its residents called it) is one of the New Wonders of the World and a World Heritage site. The city is located in Jordan atop Mount Ho and is famous for its rock cut architecture and water conduits system. The city which was established in the 6th century BC is a symbol of Jordan. Our chronicler Pliny the Elder (who BTW died during the eruption of Pompeii because of his curiosity) identified Petra which was a natural fortress as the capital of the Nabataeans and the center of their caravan trade. 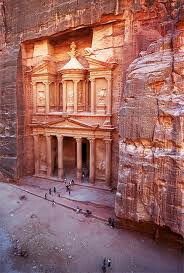 After the 2nd century BC, Greek, Egyptian and Syrian cultures influenced the culture of Petra. In 106 AD, Petra was absorbed into the Roman Empire. The city prospered under Roman rule for a century until abruptly coinage ceased and tomb building ended owing apparently to some sudden catastrophe. An earthquake in 363 AD destroyed many buildings and crippled the water management system. Christianity came to Petrain in the 4th century AD. At least one of the tombs was used as a church. 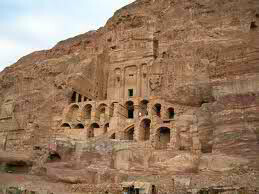 After the Islamic conquest of 629–632, Petra became Islamic. Later, Petra was occupied by Crusaders who held the town until 1189. The town fell into obscurity after it again became part of the Islamic Empire. In 1812 the Swiss explorer Johann Ludwig Burckhardt introducedPetrato the Western world.